SARD Cleaning Spray Kit (SCS) UNIVERSAL - Dezod Motorsports Inc - Home of the automotive performance enthusiast since 2002. 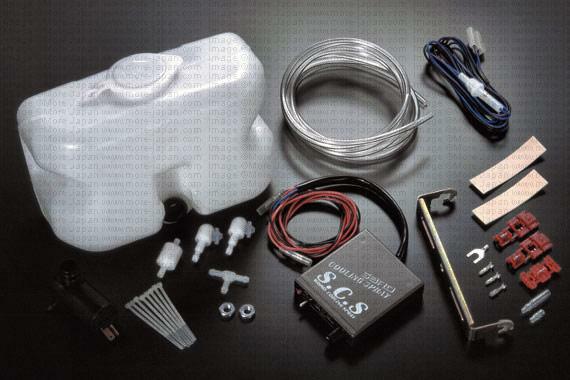 The SARD SCS (Sard Cooling Spray Kit SCS) is an electronic cooling device that is attached to an external liquid reservoir and motor to automatically spray the radiator (or intercooler) at a certain temperature, or it can be manually set and turned on. This may be used as a reliability or a performance device. This can quickly reduce the water temperature if the cooling system starts to overheat, or it can cool the intake air temperature to reduce performance loss and knock with higher intake air temperatures. The misting system can be setup for many purposes, and can hold many different types of liquids.